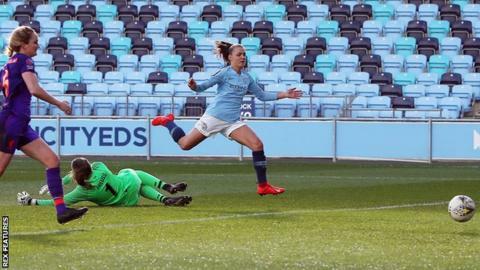 Manchester City Women remain on course for a treble after two Georgia Stanway goals helped them overcome Liverpool to reach the FA Cup semi-finals. Janine Beckie fired home from close range to put City ahead at the break. Substitute Stanway made it 2-0 with a neat finish and added a third late on to ensure City progressed to the last four for the fifth successive year. City, who are top of the Women's Super League, won the League Cup in February after beating Arsenal in the final. The draw for the last four will be held on Monday, live on BBC Breakfast on BBC One, shortly after 08:30 GMT. Seven spots and 25 points separate the two sides in the Women's Super League table, but Manchester City were made to work hard in the first half. Beckie finished what was a rare chance in the opening 45 minutes for the hosts, swapping passes with Caroline Weir in the box before firing into the roof of the net. Rinsola Babajide was a constant menace for Liverpool, with the striker producing their finest moment of the game with a dipping shot from outside the box that tested Karen Bardsley in City's goal. It took just three minutes for Stanway to make an impact after replacing Beckie, racing into the box to meet a pass from Nikita Parris before slipping the ball past Anke Preuss. A fiercely-stuck third from Stanway was the pick of the goals and sent City into Monday's draw in fine style. Manchester City Women: Bardsley, Stokes, Beattie, Houghton, Bonner, Walsh, Scott, Weir (Emslie 72), Wullaert (Hemp 82), Beckie (Stanway 65), Parris. Unused substitutes: Roebuck, Lawley, Bremer, McManus. Liverpool Women: Preuss, Robe, Bradley-Auckland, Fahey, Purfield, Rodgers (Hodson 90), Murray (Little 75), Coombs, Daniels, Babajide, Sweetman-Kirk. Unused substitutes: Kitching, Kearns, Linnett. Match ends, Manchester City Women 3, Liverpool Women 0. Second Half ends, Manchester City Women 3, Liverpool Women 0. Substitution, Liverpool Women. Ashley Hodson replaces Amy Rodgers. Offside, Liverpool Women. Amy Rodgers tries a through ball, but Leandra Little is caught offside. Attempt saved. Claire Emslie (Manchester City Women) right footed shot from the left side of the box is saved in the centre of the goal. Assisted by Keira Walsh. Goal! Manchester City Women 3, Liverpool Women 0. Georgia Stanway (Manchester City Women) right footed shot from outside the box to the bottom right corner. Assisted by Claire Emslie. Foul by Gemma Bonner (Manchester City Women). Niamh Fahey (Liverpool Women) wins a free kick in the defensive half. Claire Emslie (Manchester City Women) wins a free kick in the defensive half. Attempt missed. Leandra Little (Liverpool Women) header from the centre of the box is close, but misses to the right. Assisted by Jemma Purfield with a cross. Substitution, Manchester City Women. Lauren Hemp replaces Tessa Wullaert. Attempt blocked. Jemma Purfield (Liverpool Women) left footed shot from outside the box is blocked. Assisted by Courtney Sweetman-Kirk. Offside, Manchester City Women. Tessa Wullaert tries a through ball, but Nikita Parris is caught offside. Corner, Manchester City Women. Conceded by Jemma Purfield. Substitution, Liverpool Women. Leandra Little replaces Christie Murray. Attempt missed. Georgia Stanway (Manchester City Women) right footed shot from the left side of the box is close, but misses to the right. Assisted by Claire Emslie following a set piece situation. Claire Emslie (Manchester City Women) wins a free kick on the left wing. Substitution, Manchester City Women. Claire Emslie replaces Caroline Weir. Goal! Manchester City Women 2, Liverpool Women 0. Georgia Stanway (Manchester City Women) right footed shot from the centre of the box to the centre of the goal. Assisted by Nikita Parris. Attempt missed. Stephanie Houghton (Manchester City Women) right footed shot from outside the box is just a bit too high from a direct free kick. Georgia Stanway (Manchester City Women) wins a free kick in the attacking half. Sophie Bradley (Liverpool Women) wins a free kick in the defensive half. Foul by Demi Stokes (Manchester City Women). Yana Daniels (Liverpool Women) wins a free kick in the defensive half. Substitution, Manchester City Women. Georgia Stanway replaces Janine Beckie. Attempt saved. Laura Coombs (Liverpool Women) right footed shot from outside the box is saved in the bottom right corner. Assisted by Amy Rodgers. Foul by Jennifer Beattie (Manchester City Women). Rinsola Babajide (Liverpool Women) wins a free kick in the defensive half. Janine Beckie (Manchester City Women) wins a free kick on the left wing. Second Half begins Manchester City Women 1, Liverpool Women 0. First Half ends, Manchester City Women 1, Liverpool Women 0. Attempt blocked. Caroline Weir (Manchester City Women) left footed shot from outside the box is blocked.